Before reading this article, I didn’t know about the “seven Baby B’s” but I do practice them all. So I guess that makes me an attachment parent! But I would never say, ”We are doing attachment parenting.” I feel like I am just doing what comes naturally. Honestly, I think a lot of what I do benefits ME as much as the kids. Breastfeeding has been easy for me, and I know it is good for Augie. I may have breastfed Adelaide more than two years except that it seemed to be getting in the way of TTC. Babywearing helps me get things done around the house. Adelaide wanted to be held all the time, so I held her all the time. Augie does not like to be held as much, so I don’t carry him around very often. Co-sleeping lets me get the most sleep while nursing at night. And I really like to sleep! Adelaide’s bed is two feet from our bed because we live in a one-bedroom house. But I kind of like it that way. 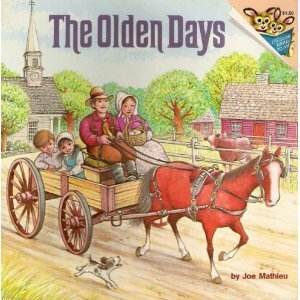 I had this book called “The Olden Days” when I was little, and everyone slept in the same room to conserve heat, and I always thought that was cool. Just seeing the book cover brings back memories! I had my own room when I was little. I remember laying awake at night. I would listen to cassette tapes or watch Nick at Nite as I was falling asleep so I wouldn’t be alone. I remember that I got to sleep in Mom and Dad’s bed sometimes; I loved the familiar smell of their pillows, and I felt so safe there. I also know that I kept my parents awake by rolling around and kicking off the sheets. My point is, for me, attachment parenting is the path of least resistance. I think that parents need to practice whatever parenting style keep them sane and well-rested. Studies show that sane parents are better than insane parents. If attachment parenting brings peace to your home, then by all means, do it! And if schedules bring peace to your home, then be on a schedule. One more thing to keep in mind—those people who stop you in the supermarket to say, “Enjoy every moment!” They are weird, but they are right. Holding Adelaide eight hours a day worked for me because I was able to do that for her, and I knew that it would not last forever. And in fact, she is three years old now, and it is difficult to even remember her as a baby. God willing, there WILL be time for you and me to pick up where we left off before we had kids. But this baby time—it is special, and it is short.